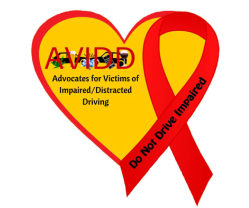 AVIDD VOICES is a panel of volunteers that are victims of impaired or distracted driving crashes. The volunteers speak to individuals that have been court ordered to attend the panel. Their efforts are to bring awareness to the attendees of the possible hazards of driving while impaired or distracted. 1) Identification, i.e., Social Security Card, Military ID, Passport, Picture ID, or Utility Bill with name matching court order. 2) Payment of $40.00; may be money order or cash (exact amount only, change cannot be made) Attendant may pay here or at the meeting during processing. Attire for the Panel will be the same as appearing in a court room. No hats, bandanas, scarf’s, due rags, or any other head gear. There will be no drinks or food allowed in Panel. Cell phones must be silenced or turned off. No texting allowed. Beepers must be silenced. No tobacco use during Panel. No Alcohol use before or during Panel; if suspected that attendee is “impaired”; law enforcement will be notified immediately. Zero tolerance. Attendee is to pay attention to presenter/s during Panel. No sleeping, talking, disruptive behavior. If attendee is disruptive; attendee will be removed from Panel and will forfeit entry fee. Court Clerk will be notified as to why attendee was removed. After completion of Panel meeting you will receive a copy of court order with signature and seal. You are required to return this copy to court or probation officer where court order originated for proof of attendance. Attendee will not leave until dismissed and receiving court order and receipt.